Our department is known on campus as being open and friendly. Twenty-five faculty guide 40-50 undergraduate concentrators and 50-60 graduate students in a colloborative and fun learning environment. We are nationally recognized for excellence in teaching and research. 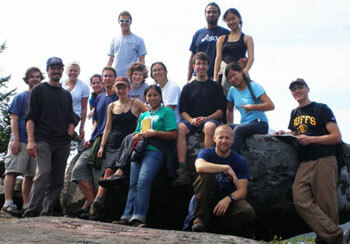 A GEOL 1240 class fieldtrip to NY with Professor Jim Russell (second from left).